If you're planning on packing some over-the-counter remedies for insect bites before jetting off on holiday you may want to think again. For researchers have claimed there is little evidence to prove such non-prescription remedies have any effect on bites. Evidence published in the Drug and Therapeutics Bulletin claims the bite remedies often packed by holidaymakers are unnecessary in many cases. 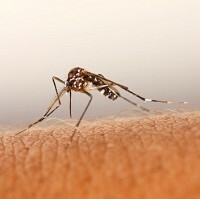 However, when bites cause an infection or anaphylactic shock then medical treatment is needed, the DTB said. Treatment in such cases will likely be covered by a decent medical travel insurance policy, reminding travellers of the importance of such precautions. But in many situations bite reactions are not severe enough to need medicine, the researchers found. People are often advised to use antihistamine tablets to ease the itching of insect bites, however the scientists said this cannot be proven. Other products recommended for itching and swelling include steroid creams and pills but there are no facts to back up their use, the DTB said. The DTB concluded: "There is little evidence for the efficacy of treatments for simple insect bites. The symptoms are often self limiting and in many cases, no treatment may be needed." The research used products that have not been licensed for use in the UK.